We all know that one of the basic functionality of our phone is to send text messages or SMS. However, it costs us a small amount of money to send SMS. There might be unlimited SMS packages provided by your phone network but for that we have to pay a certain amount of charge. SMS might also come free with talk times purchased. In all cases there are costs involved either directly or indirectly. Android has a rich collection of apps in the Play Store. Recently it reached one million apps, which is a big milestone. Out of those millions of apps, there are many which support sending free text messages. But those text messages are sent to your friends if they have the same app installed. Those are actually in app text messages. Examples of those apps are Whatsapp and Viber. While those text communication apps are quite undoubtedly useful, we might need to send text messages to actual phone numbers and we want the message to reach them even when the user is not online or not connected to the internet in her or his phone. 1) biNu: When it comes to Free International SMS, Binu (stylized biNu) is a hit. This is a simple app with an interface that might not be the best but its functions are top notch. You get to send true free international SMS or text messages all over the world. People do not require to have this app installed on their phone. The receiver sees your number as the sender when they get the message. The amazing thing about this app is that it covers all the countries in the world. This is not a free US and Canada only SMS app. It supports almost all the countries. You can send free or premium text messages from biNu. Premium text messages are the ones without any ads. You receive 7 premium credits per week automatically. That allows you to send 7 text messages with 160 characters limit. If you run out of premium credits, you should not worry. The credits get replenished every week and there is a free SMS option as well. Free SMS do have a short link at the end promoting this app itself. biNu has a whole lot of range of other features such as news, a social network and so on. 2) textPlus Free Text + Calls: This is the first sms app that caught my eye. Quite popular in the app store with 10 million to 50 million installs and a rating that is above 4, this app allows your to send free text messages to real phone numbers. This app supports sending SMS to numbers in the US and Canada. It costs you nothing except some micro charges for your internet use. You can also receive a free US phone number from where you will be sending and receiving text messages. You can make voice calls from and to this number but calling is not free and requires credits. But SMS is totally free. 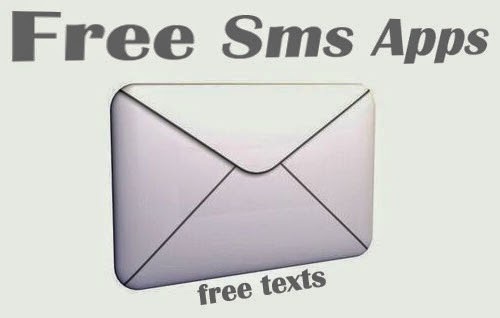 3) 24SMS - Free International SMS: Supporting over 150 countries, this is a true free texting app. You send texts to phone numbers and the other person should not have this app to receive texts. Unicode text messages are also supported which is great. 4) yuilop: Free Calls & Free SMS: This is another app that allows you to send SMS messages to US. You can also send SMS messages and call to other countries using the in app credits. Credits are earned by completing offers such as installing more free apps, watching video ads, receiving text messasges to your yulop number or by inviting friends. 5) Text Me! Free Texting & Call: This is another texting app that supports texting with the help of in app credits. You get 10 credits while you sign up and you can get more credits by watching video ads.